Barley is one of the healthiest choices of cereals in breakfast these days. In recent studies, it has been proven that this whole grain barley contains miraculous health benefits. Especially the barley water benefits are giving amazing health boost to the whole body. This cereal grows on plant belonging to the Gramineae grass family. It has a rich nut flavor with a chewy consistency. This whole grain is not just consumed as a cereal by its fermented to be used in beer, used in malt beverages as its rich in maltose as well. Amongst the usage of barley whole grains as breakfast cereal, drinking barley water possesses greater benefits to the health. In culinary purposes barley is used in many forms such as barley grass, hulled barley, pearl barley, barley flour, barley green powder and barley water. Other than its culinary usage this wonderful whole grain is rich in nutrients, vitamins and antioxidants for providing overall health benefits. Now, let’s discuss about the barley water benefits and uses to treat various health conditions naturally and easily. Before we begin discussing about the barley water benefits and remedies for treating various health conditions here is a recipe for homemade and preservative free barley water. This homemade barley water is sugar free and is completely natural so one can incorporate this barley water in any of these home remedies without any side effects. First of all, rinse the barley well under running water. Then soak the barley in ½ liter of water for 4 hours or overnight. Later strain the water from soaked barley. Add 3 to 4 cups of water to the soaked barley and put it on heat. Allow the barley to boil in water for 40 to 60 minutes or until the barley grains are completely cooked. Then remove it from heat and allow the barley infused water to cool down to the normal room temperature. Strain the cooked barley grains from the water and discard the grains. Use this barley water in any of the home remedy recipes mentioned below. This barley water can be stored in the refrigerator for up to 3 days. Barley is a good source of soluble and insoluble fiber. The high volume of fiber called beta glucans in barley makes one feel fuller for longer time so one doesn’t consume additional calories. Thus, this remedy results in a successful weight loss within a limited period of time. First of all, rinse the barley seeds well with plain water. Then add 2 liters of water to the rinsed barley seeds. Later put the barley seeds with water on the heat to boil. Allow the water to boil for 30 to 45 minutes or until barley seeds look translucent and bloated. Later remove from heat and strain the barley water. For enhancing the taste of barley water add lemon juice, salt and honey to 1 glass of barley water. Stir well and drink this barley water 3 to 4 times a day. This process must be followed regularly 3 to 4 times a day for at least 1 month for effective weight loss results. Barley is known for its rich source of insoluble fiber which is highly beneficial for the heart health. This insoluble fiber content forms an acid called as propionic acid which helps inhibit enzymes that are responsible for the production of cholesterol by the liver. The barley fiber provides beta glucans which is required to bind the bile in the digestive tract to cholesterol. Therefore, barley water benefits are good for flushing out the cholesterol from the body. For cholesterol lowering benefits, drink at least 4 to 5 glasses of barley water throughout the day. Barley water is a natural diuretic which increases urination to flush out toxins, cystitis and infection causing bacteria. Regular consuming of barley water even helps to cleanse the kidneys effectively. To treat urinary tract infection, one must drink at least 5 to 6 glasses of barley water daily. Hard deposit of minerals and acids formed inside the kidney is called kidney stones. In treating kidney stones barley water is considered as one of the best home remedies. Barley water has multiple effects for treating kidney stones. Barley water creates required pressure on the bladder to help eliminate kidney stones easily. Barley water maintains the required pH balance in the body to prevent the formation of kidney stones. 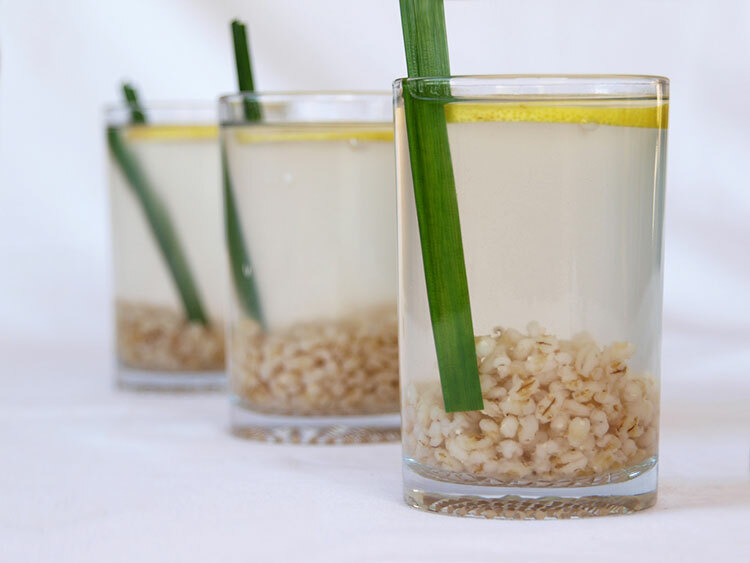 Barley water is a great remedy to nourish the kidneys and maintain it in the best condition. Barley water is rich in dietary fiber, magnesium, and vitamin B6. The nutrient content decreases the emission of calcium through urine and even breaks down the calcium oxalates in kidneys. Drinking barley water regularly prevents recurrence of kidney stone. Take a glass of homemade barley water and add in lemon juice. Then add in honey and mix barley water well. Drink this barley water with lemon juice and honey throughout the day. This process must be repeated regularly 5 to 6 times a day until the kidney stone is flushed out of the body. Barley water contains alkalinity and fiber which aids in digestion and improves the intestinal function. Barley water is even a great drink to restore the electrolytes levels and combat dehydration. Drink plenty of barley water before meals. This process can be repeated throughout the day for maintaining a healthy digestive system and absorb food better. Barley water is one of the most natural and inexpensive remedies to maintain a healthy heart. As barley water helps to prevent atherosclerosis, a condition which thickens the arterial walls due to coagulation or deposition of cholesterol. Barley water is a good source of vitamin B niacin which is rich in anti-inflammatory and lipid altering properties. These properties help in delaying the development of atherosclerosis. Moreover, barley water benefits are known to lower high blood pressure. To improve the heart’s functioning and avoid cardiac complications drink a glass of barley water daily. Barley water is a wonderful remedy to stabilize the blood sugar levels as the beta glucans in barley slows down the absorption of glucose. Many studies have even proven that beta glucans is beneficial in improving glucose control and insulin resistance. Moreover, barley water’s low glycemic index and phytochemicals even prevents obesity which is one of the primary causes of type 2 diabetes.